If you're planning to volunteer, please sign-up so we know you're coming. Thank you! 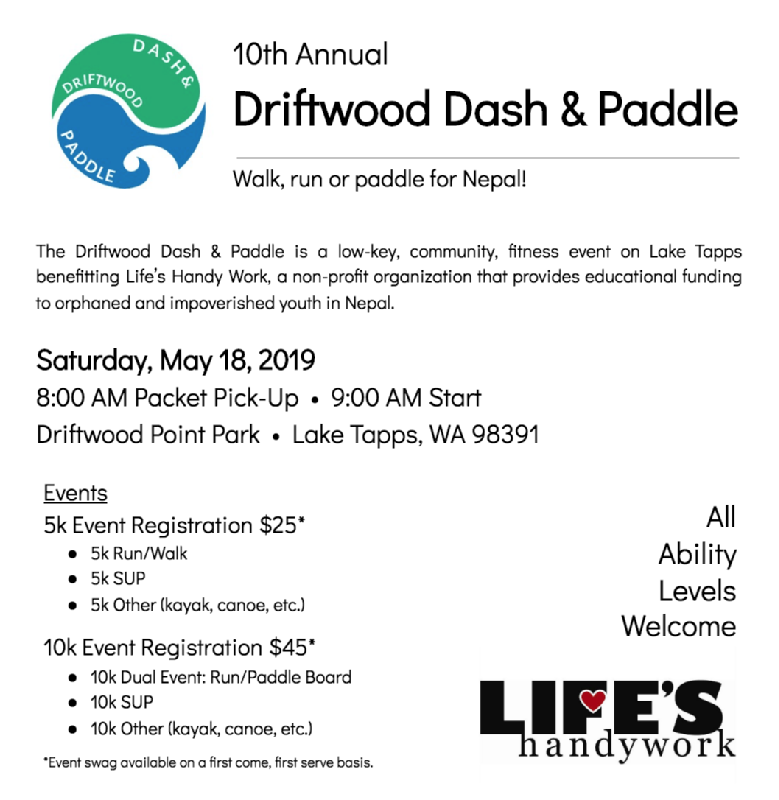 The Driftwood Dash & Paddle is a low-key, community, fitness event on Lake Tapps benefitting Life’s Handy Work, a non-profit organization that provides educational funding to orphans in Nepal. In the wake of the devastating earthquakes of 2015 and the current economic crisis, funding for education is more critical than ever. Join us to walk, run or paddle for Nepal! All events start at 9:00 AM. Packet Pick-Up and late registration start at 8:00 AM. Event swag is first come first served. 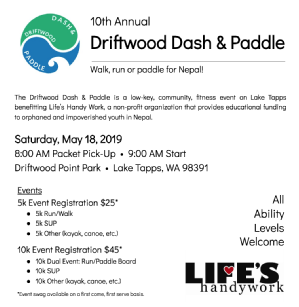 The Driftwood Dash & Paddle is child and dog friendly. Paddlers, please arrive and register by 8:10 AM to ensure you are available for the paddler's meeting before your event. We've decided to eliminate plastic from our race for environmental reasons so pack your own hydration. The environment thanks you! Top three placers by gender in each category with five or more participants will be recognized at the award ceremony. Categories with less than five participants in attendance per gender will be reduced to one or two participants being recognized as placers at the award ceremony. Other award categories include fastest kid (5k Run), fastest stroller (5k run), fastest dog (5k run) and Best & Brightest Neon.